The cathedral of Santa Maria della Bruna, has been closed for over 10 years: 2003 saw the collapse and closure of the first and second aisles, with the final closure of the church dating back to 2006.
in late 2014, new funding was allocated to complete the renovation work, including the consolidation of the roofing of the central nave, restoration of the paving, restoration of the aisles, the Sacramento and the Nativity Chapels. 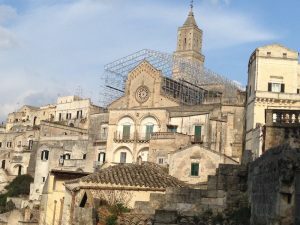 In order to carry out the sensitive consolidation and restoration work of the beautiful cathedral of Santa Maria della Bruna of Matera, it was necessary to isolate the construction site by completely enclosing the cathedral with tarpaulins. 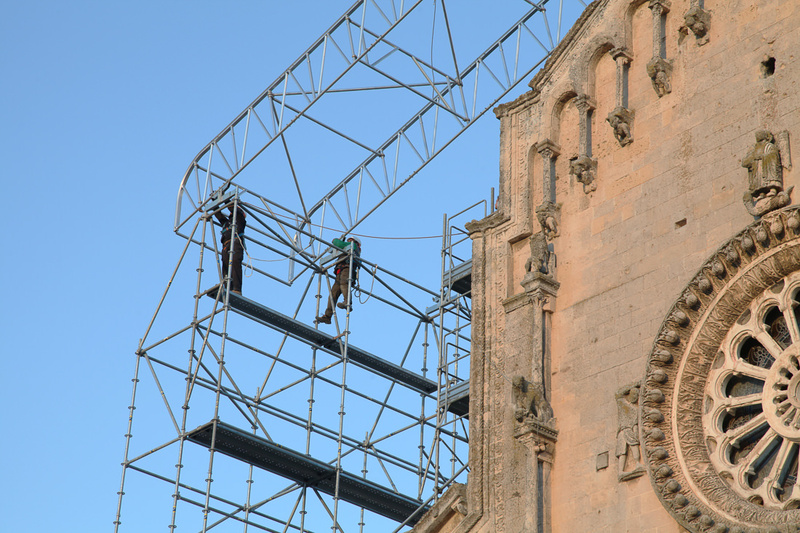 A scaffold of 83 cm, anchored to the wall of the cathedral was built to carry out the renovation work, combined with a scaffold of 250 cm for a total height of 20 m, which included a overhang of 10 m. The 250 cm module was used to reinforce the lateral thrust of the structure. to adapt the structure to the existing irregularities. An SE scaffolding module was used to take advantage of the possibility to assemble it from below, ensuring maximum safety: with the special parapet frame, when the operator climbs to the top levels he is already protected against accidental fall. 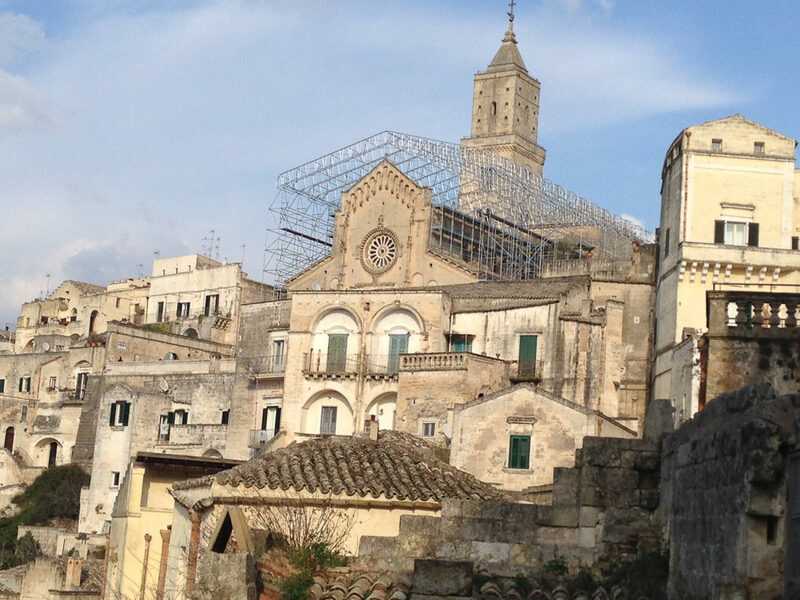 The SE scaffolding does not follow the outline of the facade, but continues in height reaching the gable of the roof which allows the tarpaulins to completely enclose the church. 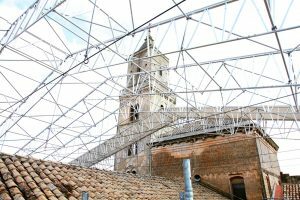 A double pitched temporary roof structure was made to give cover to both the nave and the aisles as requested by the restoration company in order to freely work on all surfaces. 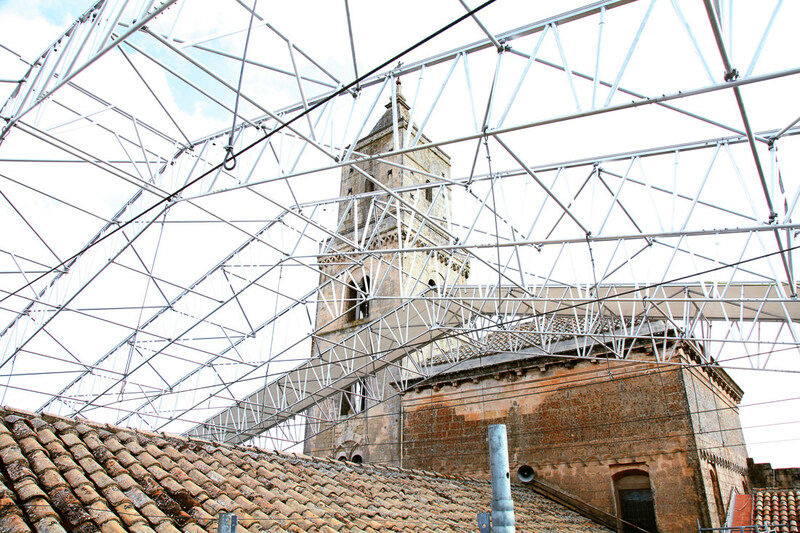 The temporary roofing was fixed to the MP bearing structure and made more rigid by the addition of steel rods, placed every 2.5m, connecting the two wings of the scaffolding passing over the roof of the church. Further PVC tarpaulin was required, placed inclined between the end section of the roofing structure and the lateral scaffolding to keep dry from rain the facades. 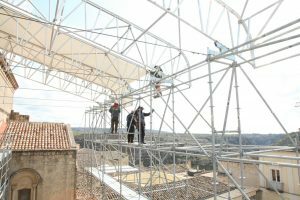 Another specific request by the restoration company was to be able to deposit the work materials directly on the roof by crane. This was allowed by keeping free of horizontal and diagonal braces one of the spans of the roof to allow the temporary removal of the tarpaulin and leave enough space to place materials and equipment. The technical details of every single stage of the assembly were provided to construct the provisional roofing: handling, mounting and dismantling.